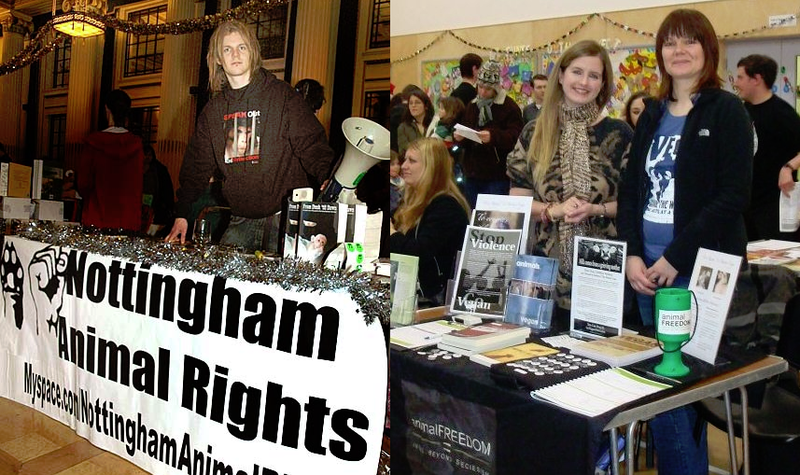 As another academic year begins many animal rights groups will be rubbing their hands at the prospect of attracting dozens of new members during the Student Orientation Week (Freshers’ Week in the UK) at their local university. Brightly coloured stalls with free gifts, vegan food and animal rights literature will appear on university campuses world-wide. ..do nothing and walk away muttering about anti-scientific madness. The result? The students manning the stall spend their entire day with only positive messages coming in from students who know little about the importance of animals in medical research. It’s time to burst the bubble. Make sure you are polite and calm but assertive in what you are saying – it should at least give them something to mull over. Well over 700 individuals signed their support to Animal Research and th new Oxford Biomedical Facility at Freshers’ Fair over 3 days, making Pro-Test one of the most successful stalls at the event. Pro-test would like to thank everyone who signed, and the hundreds who added that they would like to get involved in the campaign. It was pleasing to see the odd double take, with people walking past before stopping with “…wait – did you say FOR animal research – give me a pen”. The mass signups suggest a strong turnout to come at February’s march – and we look forward to seeing all those who signed, and more, at the rally. Generally it was great to see so much positivity surrounding our presence at Freshers’ Fair. The success of the Pro-Test stall at Freshers’ Fair shows once again that students are in support of the lifesaving animal research and the new Oxford Biomedical Facility. 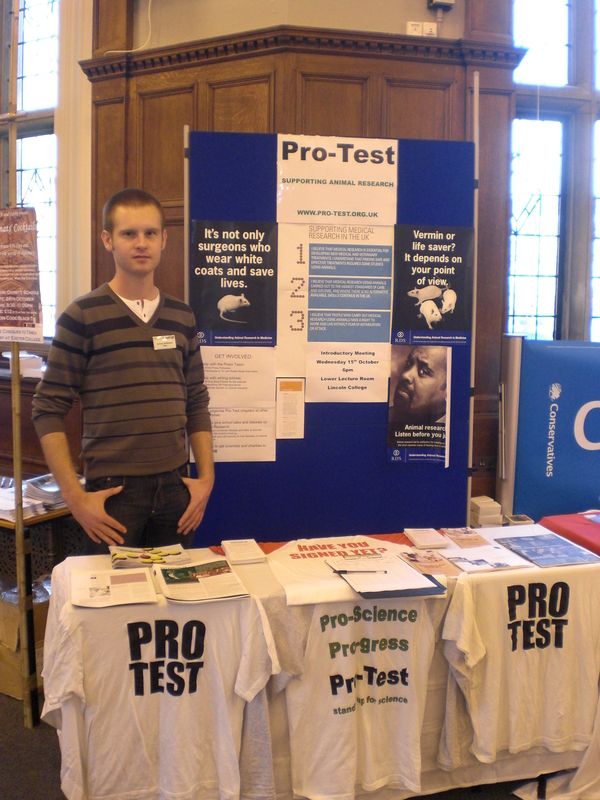 This builds on the success of Pro-Test at the last Freshers’ Fair, as well as the OUSU referendum in 2006, in which over 90% of students voted to support animal research and new lab. This year the Pro-Test stall proved to be an enourmous success, with well over 700 signatures in a petition of support. Pro-test would like to thank everyone who signed, and the hundreds who added that they would like to get involved in the campaign. It was pleasing to see not just science students, but also art and social science students rushing over to sign up and show support for a cause that has obviously appealed to a wide cross-section of the university. After seeing partner organisations being established overseas, including in the United States this year, it was great to see that this issue continues to enjoy huge support in the city where the original campaign was launched. No doubt this success predicts another exciting year ahead for Pro-Test and the hundreds of new members eager to get involved. So please keep us updated about the locations of animal rights groups on your campus, and make sure not to stay silent. Posted on September 6, 2012 by EditorPosted in Campus Activism, NewsTagged animal rights, animal testing, challenging, Freshrs week, pro-test, Student Orientation, Student Orientation Week. Dave, (September 13, 2012, 1532) God bless you!! Finally – something we both agree on!! I loved Linda Coffelt’s cogent and persuasive arguments and views. In contrast, the ;defenders’ here don’t have a moral, scientific, or ethical leg to stand on. Of course we can — look at how we eradicated Polio for example, or how we transplant organs, or we communicate from one end of the world to the other, or how we land on Mars. Landing on Mars isn’t controlling Nature. It’s the application of physics and any number of other sciences. You think we control Nature – an entire SYSTEM of balances? Control this: http://www.youtube.com/watch?feature=player_embedded&v=yLzgzvVxUV4 And I don’t mean just surviving it, I mean HARNESS IT, CONTROL IT! Every time man tries to control any part of Nature, he creates an imbalance in the natural order of things. Well then you should shed you’re clothing, ditch your comfy house and all its amenities and live in a cave, foraging off the land. That will be the only way for you to restore the natural order of things in your own life. Otherwise, well you know the answer. Birds build nests, wolves dig out dens, man builds shelters ……. Bears catch fish, cougars kill rabbits, man fishes, farms, cultivates plants …… We’re obviously not speaking the same language. I pray you have a wonderful life. I’m going back to mine. Thanks for the well wishes. However, just about everything we do in our daily lives creates an imbalance in the natural order of things. It’s what we do. Animals being eaten by other animals is a part of NATURE and survival but isan’t trying to prolong life as long as possible nature and survival hence why medical research is so important. Because we as humans our having this debate one could judge us as having a higher level of sentience than the other organisms living on this planet. Humans have even broken away from the cycle life which affect other organisms and thus adapt the environment to suit us & and in a sense we have have jumped free of evoulution. If we were to live in tune with the distribution curves that apply to other species, our total population would be fewer than a million instead of over 7 billion. So takeing this in mind one could say the current growth rates of the human population our unsuistainable for the planet Earth and its resources and one should stop this from occuring by stopping all medical research but this is complety against our SURVIVAL INSTINTS. And I believe a very appropriate sentence for someone who sets a dog on fire while giving birth, or sticks a firecracker in a dog’s mouth, while binding it so he is left to roam for DAYS in pain while starving to death because half his face has been blown away, or half buries a kitten in wet cement so that it dies an excruciating death of terror and pain as the cement dries, squeezing the life out of it should be to REPLACE animals in experiments in order to pay back, in part, their debt to society by allowing the MOST ACCURATE testing to be accomplished for the betterment of mankind. After all, they would be treated a lot more humanely than they showed their victims. I see it as a win win scenario. While I agree that there should be severe punishments for those who torture animals (I do NOT mean doing animal research, I meant the examples of pointless violence to animals you mentioned), humans would not make a suitable test subject in many cases. 1) You need many, nore or less identical, test subjects which have a full and clean medical history – which “wild” humans do not. I will never understand how one can say it is unethical to use humans yet firmly believe it IS ethical to use non-humans. I believe ALL life on Earth is precious, necessary, and equal, and should be understood, loved, and cherished. The use of non-human animals is, as evidenced in your comment, CONVENIENT. Yes, by the criteria stated, it would be impractical to utilize humans in such a manner. But what would make it distasteful (i.e., “unethical”) to the general population, would be the large numbers needed, NOT because of the idea of it. Human testing is being done every day. It has been done in the past. And if it is so unethical, why is it allowed on every major campus of higher education throughout the world? Volunteers are sought for any and all kinds of testing, and compensated for same. At a time in human evolution, when we as a species are finally accepting the value and sentience of non-human life, to continue to cruelly USE non-humans for the sheer purposes of improving our own predicament in the world is a backward-stepping, civilization regressing, moral hindrance to our progression as a civilized world. Who are we to play God with the Earth? Yes, we rule and judge our own kind, but to do so with the population of the entire animal kingdom is so unconscionably arrogant! You do realise if all life is equal then all animals and humans that eat other plants or animals must be committing an immoral act. Are you a fruitarian? We use animals for the advancement of both humans and animals (where do you think veterinary medicine comes from). Relative replacements, which replace the use of ‘protected’ animals with other species e.g. invertebrates, larval forms of amphibians and fish until the stage where they become capable of independent feeding. Refinement: Improvements to scientific procedures and husbandry that minimise actual or potential pain, suffering, distress or lasting harm and/or improve animal welfare in situations where the use of animals is unavoidable. Examples could include reducing stress by developing new approaches such as training animals, use of non-invasive techniques or enrichments that improve living conditions. Reduction: Methods that minimise animal use and enable researchers to obtain comparable levels of information from fewer animals, or to obtain more information from the same number of animals, thereby reducing future use of animals. Examples could include: Improved experimental design and statistical analysis; data and resource sharing; and use of techniques such as imaging. If animal testing has to be done make sure the results benefit more than one animal species and make sure the benefits are towards health/prolong life and not for commecical/profit gain. Also encourge more awarness campaigns so the public are aware of what experiments are takening place. The public should and probably are aware of the benefits animal testing has already given to them. To show we are not evil unethical monsters maybe we should set up memiorials for those animals who have already been sacrificed in the war against illness and disease for example Some medical schools and agencies in China, Japan, and South Korea have built cenotaphs for killed animals. In Japan there are also annual memorial services (Ireisai 慰霊祭) for animals sacrificed at medical school. using animals to test cosmetics is banned in the UK…. Yes, I know. But they aren’t in the USA, China, or any number of other countries. And how many cosmetic products sold in the UK are from these countries. Linda, you are aware that human trials are a PART of the process right? Also, it’s important to remember that not all, or even most, of the research done with animal models is done to develop new drugs. Pharmaceutical research is only one aspect. It would be like studying Art and only using Ilya Bolotowsky as your reference. Linda, I see where you’re coming from but I don’t AMP had intended their sentence to mean “any methods”. They meant any ethical methods, and to most people the use of animals for the continued development of medicine is an ethical method. Regarding the claims of ALL the scientific and medical advances that have been made at the cost of animal abuse and torture in labs, well, think of all the medical knowledge that resulted from the “experimentation” done under the leadership of General Shiro Ishii, in Unit 731. Perhaps we should re-establish this Unit and continue the very valuable work conducted in the original Unit. You never know what advances for mankind can be made!!! The answer to who should be used for medical research is quite simple. All animal abusers, no matter how soft or harsh their punishment is under the laws of their locale, should have MANDATORY registration in a WORLD-WIDE REGISTRY which will be used as needed to supply test subjects to labs all over the world in any and all institutions for testing and experimentation. This should not meet with any opposition from any government, since they will be the first to claim that all CURRENT test subjects are not, BY LAW, being subjected to inhumane practices, and that research and testing is strictly controlled, particularly regarding potential pain. No one in the scientific community should object since, as is stated by Americans for Medical Progress: “Researchers have a moral obligation to use all tools available to enhance our ability to prevent, diagnose, and treat disease in people and animals.” Using HUMANS for these purposes would obviously provide them with the most accurate test results. This is CLEARLY a sensible, practical, COST-EFFECTIVE, and JUST solution to laboratory experimentation / testing AND as an animal abuse deterrent. NO CREATURE SHOULD SUFFER AGAINST ITS WILL FOR THE BETTERMENT OF ANY OTHER CREATURE!! Once established, humans utilized in this system HAD A CHOICE NOT to abuse an animal, and therefore not to suffer the consequences of their own actions! What if people on that list you suggest have been wrongly accused or evidence is discovered latter on which proves the person innocence what happens then. NO CREATURE SHOULD SUFFER AGAINST ITS WILL FOR THE BETTERMENT OF ANY OTHER CREATURE well thats a lie think about all the animals which die at the claws,jaws of predator animals. There are alteratives but these alteratives also have there own issues such as Accurateness e.g. good at testing one particular organ system instead of whole organisms also some alteratives have there own ethical issues such as tissue cultures dervide from embryonic stem cells(ESCs). To extract ESCs requires the destruction of the embryo which had the potenial to become a human or animal. What animal rights groups should be doing is rasining money and supporting research whos aim is to refine/improve these alterative method instead of giving money they raise to terroist groups who fire bomb labs and threaten scientists and there familys. I know some animal rights group do this but not all of them. Convicting an innocent person is a possibility in ANY prosecution carried out by our adversarial criminal justice system. Should we therefore end capital punishment as well? Animals being eaten by other animals is a part of NATURE and survival, NOT one of an arbitrarily established hierarchy of dominance for the purpose of unnatural acts against nature. Just Completed a degree in animal science so don’t think I can attend ithe universties freshers week. I also second Simons comment about more dialogue. Issues in science can also focus on non animal subjects such as nuclear weapons/nuclear power, humans causing global warming and genetically modification and cloning (of plants,micro oganism as well as animals). Good thing to encourage dialogue on this issue. The usual dismissive attitude of scientists doesn’t help at all to strive towards a balanced narrative of animal need in research vs animal rights. Also, open discussion of these issues in science curriculum would be welcomed. Acknowledging the need of animal research and being sensitive to these animals’ fate is not incompatible. See, I like my bacon. But I’m not fool enough to believe the pig died happily for me. I second the motion to have as part of a science curriculum material on ethics that covers the objections by animal rights philosophers to the use of animals in research. Scientists should familiarize themselves with such arguments and be able to justify on ethical grounds their work to the public.